No Sit/No Lie citations far outnumber other citations handed out in downtown Austin, according to court records. And only a very small percentage of those fines are ever paid. About two months ago, Miguel Alfonso moved to Texas from the East Coast and wound up in Austin. He was looking for work, and in the meantime was sleeping in his car, which he would park downtown. Then his car was towed. He couldn't afford to get it back from impound, so he began sleeping on the street at night, usually downtown, usually near 6th and Nueces. “I haven’t paid them yet,” he says. 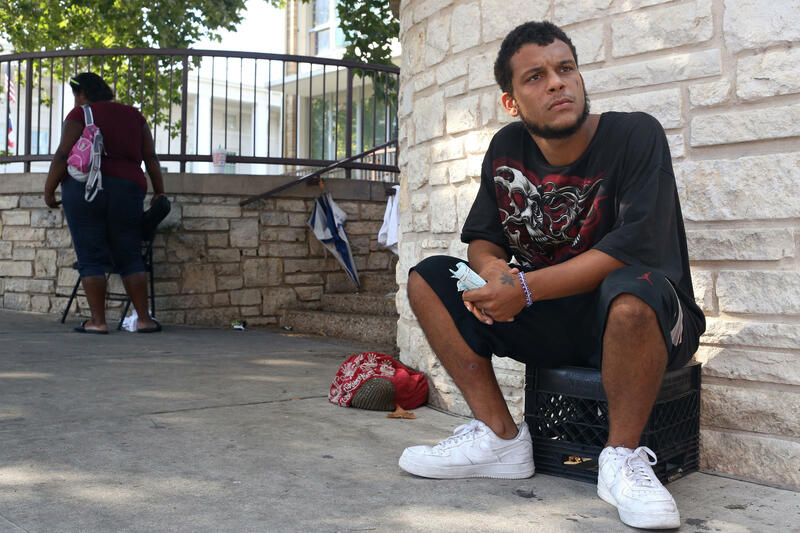 Recent Austin transplant Miguel Alfonso had nowhere to sleep after his car was towed. Within three weeks, he accrued 10 citations from APD, primarily for jaywalking and Sit/Lie violations, he says. Evan Pinkston, 24, is one among many in the homeless community who have received citations for sitting or sleeping on the streets under the city’s No Sit/No Lie ordinance. Individuals who receive citations must attend court to pay off the tickets, but this is often disregarded due to financial constraints. In that regard, he’s not alone. 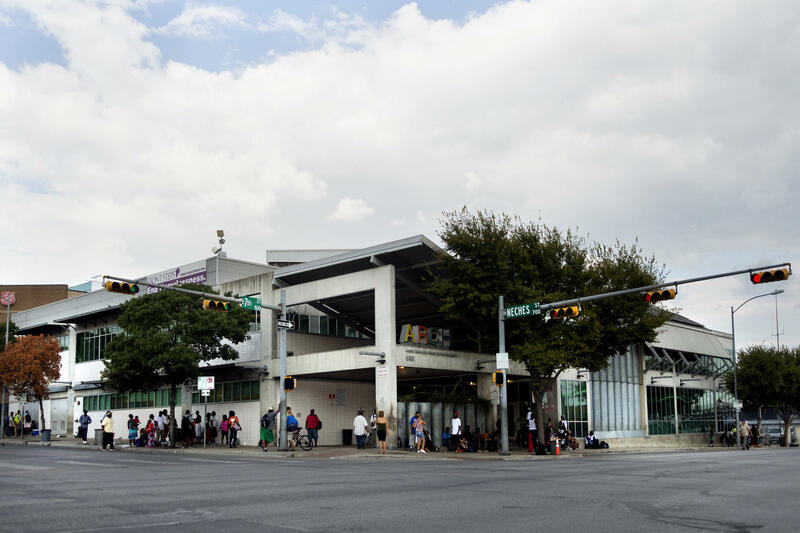 Aside from the realities of homelessness, Austinites living on the streets downtown also face costly citations from police for jaywalking, camping and other offenses. 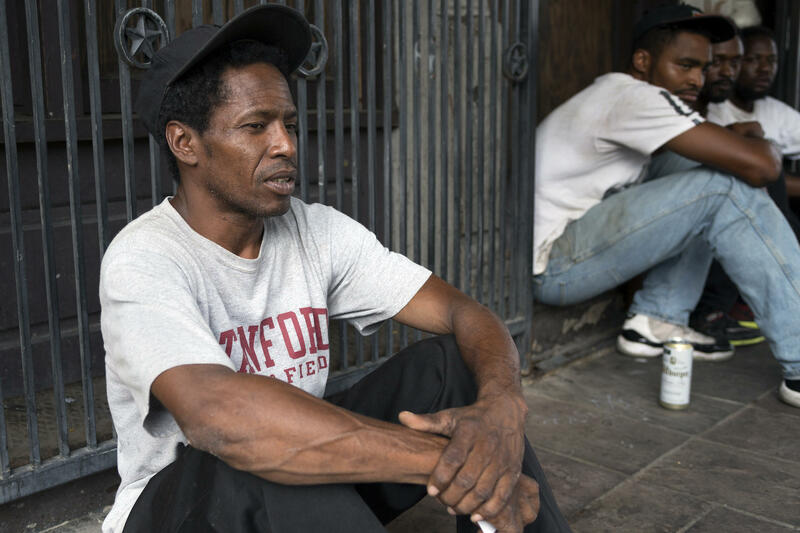 But the lion’s share of tickets from downtown police – more than public intoxication, more than jaywalking – are for sitting or sleeping on sidewalks, violating the so-called No Sit/No Lie city ordinance. Those violations have increased over the last four years, and some say they expect they’ll continue to do so as Downtown Austin attracts more tourism. 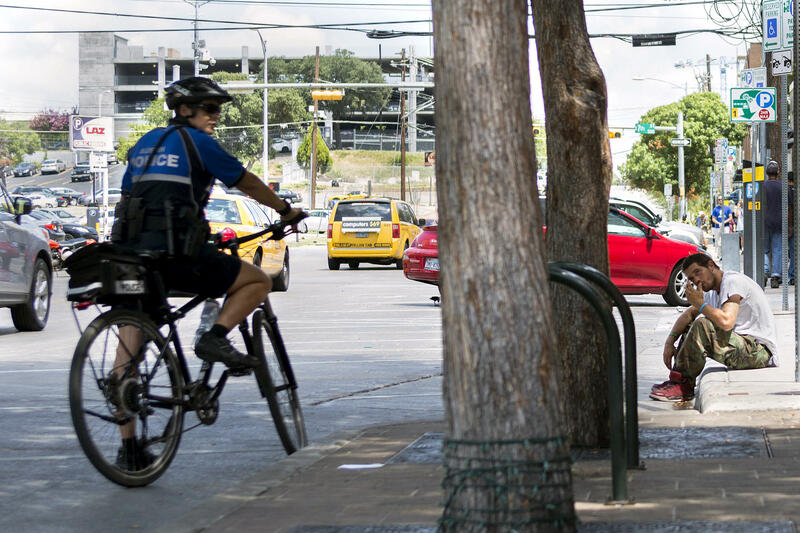 The Austin Police Department enforces the No Sit/No Lie policy downtown, in East Austin, and in West Campus, and the cases are handled by the Downtown Austin Community Court. The ordinance prohibits lying or sitting on a sidewalk, and officers must give 30-minute warnings to those observed doing so before issuing a citation. A standard ticket costs $160, plus community service hours. If a defendant doesn’t appear in court to pay the fine, a warrant is issued for their arrest — which increases the cost of the ticket to $210. More often than not, defendants never pay these fines – nearly 60 percent of defendants this year currently have outstanding warrants, and only 21 defendants out of the more than 15,000 cases from 2011 to the present — that's about 0.14 percent — have appeared before the Community Court, according to court records. During that same span, only 39 defendants paid their fines outright. However, the court minimizes fines by allowing defendants to pay them off through community service and, in some cases, through jail credit, a system in which time served in jail can count towards payment of a fine. While just over half of the community service hours scheduled for defendants were completed last year, the court is on track to meet its 66 percent completion rate for 2015 after failing to meet that goal in 2014. The court also offers resources, like meetings with caseworkers, to those with outstanding citations who are trying to transition out of homelessness and to the estimated 450 repeat offenders. Corporal Chris Carlisle says tickets are given at an officer's discretion and that all APD officers have to abide by the ordinance’s 30-minute grace period, a provision of the 2011 tweak of the law. Carlisle has been on the beat downtown since 2000 and, he says, before Sit/Lie, APD could only enforce a state law that classifies sleeping or lying on a sidewalk as a Class B misdemeanor, an arrestable offense, to deter people from obstructing sidewalks – a tactic he says wouldn’t do anybody any good. The city ordinance classifies the crime as a Class C misdemeanor, which can carry the penalty of fines up to $500 but can't result in jail time. Failure to pay the fine, however, can. Carlisle says Neches Street, adjacent to the ARCH, is an epicenter for the citations, a claim that rings true in the data provided by the Community Court: One-fifth of all citations from 2011 to 2015 occurred on Neches. 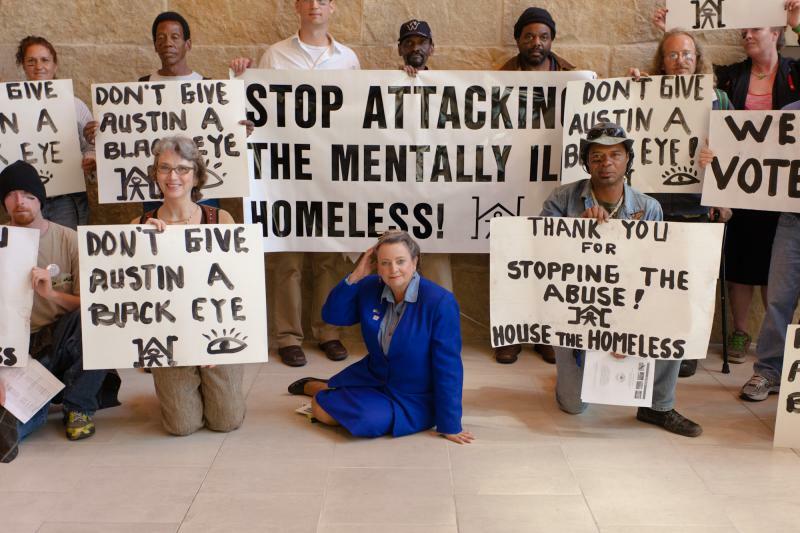 Jo Kathryn Quinn, executive director of Caritas of Austin, says the fact that the law’s essentially only enforced in Downtown Austin is frustrating for homeless advocates like Caritas, Ending Community Homelessness Coalition (ECHO) and Front Steps, which runs the ARCH, as well as other groups, many of which are located in the downtown area. The majority of No Sit/No Lie violations are handed out downtown, and more specifically, in the area right near the ARCH. Evan Pinkston shows a ticket he got for Sitting on Sidewalk. 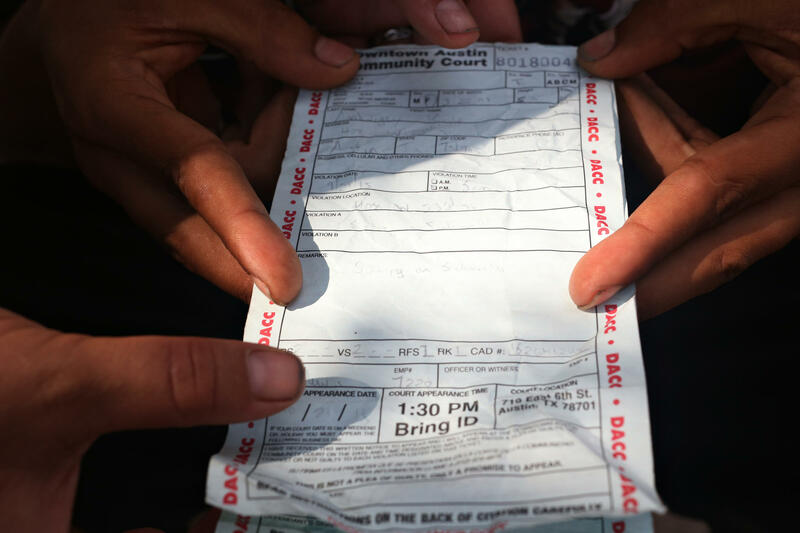 Records show about a third of the citations are doled out to “non-homeless” defendants, but police officers and the court depend on how defendants self-identify for records. So, in some instances, defendants may give an officer an address, but could still be homeless. That statement gave Quinn and others pause and led many advocates to wonder if the city’s enforcement of the policy could jeopardize $5 million in funding from U.S. Housing and Urban Development (HUD). City of Austin Prosecutor Bianca Bentzin says these cases often end in courtroom no-shows and warrants; and they also take up the largest chunk of the Community Court’s docket – Sit/Lie cases crowd out all other offenses in the court – but they can’t be so easily done away with. That coexistence could be fractured if the ordinance was done away with and, as Bentzin says, lead to a domino effect and create issues somewhere else. That coexistence, and the influx of visitors, also concerns Carlisle, who expects APD’s enforcement to increase in the next year or so, when two hotels – both on Neches near the ARCH – open up. Carlisle says the wider-than-normal sidewalk in front of the ARCH is the only sidewalk on that street as of right now, and he bets APD will be getting a lot more calls to clear the sidewalk over the next year. Miguel Gutierrez Jr. and Pu Ying Huang contributed reporting for this story. Earlier this month, the U.S. Department of Justice said criminalizing people who are homeless for sleeping in public places is unconstitutional. 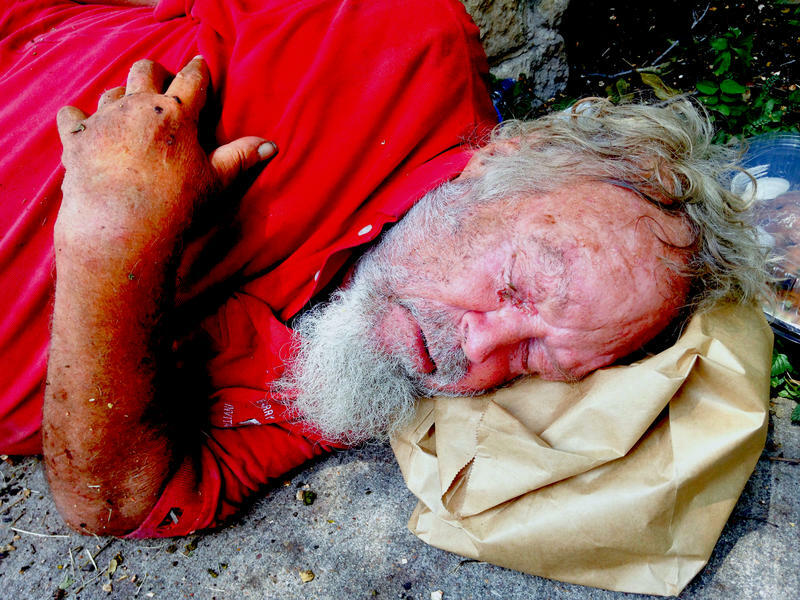 However, Austin’s had a “no sit/no lie” ordinance since the early ‘90s that bans homeless people from lying down on city sidewalks and sleeping in public. While sleeping on public benches is legal, in the past few years the city’s cut back on the number of benches. The City Council has unanimously approved what it calls an improvement to an existing ordinance that prohibits people from sitting and lying in sidewalks and in front of buildings. The ordinance will become effective starting on the 1st of May. Opponents pointed out that the ordinance did not provide exemptions in instances of extreme weather. Richard Troxell, who heads House the Homeless, called it a violation of the Americans with Disabilities Act.